I was writing a post about moving away from "genres" as video-game descriptors in favor of a taxonomy based on "core aesthetics", or what TTRPG theory calls "creative agenda". But then I found out someone beat me to it so you can just go read this. So here's a different thing I've been thinking about lately and it has to do with hidden information. Many card games are good examples of games with hidden information; for simplicity, I'm going to talk mostly about those and mostly about one-on-one scenarios. During a given turn cycle, you might make many decisions, informed by many factors. Some factors either public or known (to you) information, like the cards already in play and in your own hand. Many are unknowns, like the card's in the villain's hand. What do I think they have? How much does it hurt if I'm wrong? The first is the probability space of the unknowns, and the second is the penalty. The combination of the two dictates what, for lack of a better term, I'm going to call the attention curve: How much mental effort it costs to make the right decision. Which I will now illustrate with an MS Paint chart. Attention curve is a kind of tension: your game will feel better if it has natural ebbs and flows. If it never rises, the game is non-interactive, which is often undesirable. If it's constantly pinned to high, the player will be either exhausted by the sustained effort, or completely tune it out, like a Michael Bay Transformers movie that never gives you a chance to figure out what's going on. You don't want to be Transformers. You want to be John Wick. Let's look at some ways to regulate this, then. One is to reduce the penalty. I'm going to set this aside and maybe talk about it in another article, because it's a very dangerous knob to turn. It's almost always symmetrical and goes into issues like counter play, opportunity cost, and making sure both players have a satisfying experience. Remember, the villain is a player too, and they want their decisions to matter. 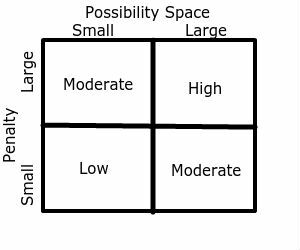 So let's set that aside and focus on the other: managing the possibility space. You want ways for players to reduce unknown information from "every card in the game" to a size they can make reasonable predictions about based on known information. A good, and popular, example is resource costs. If the opponent has only N resources available, you can dismiss from consideration all cards that cost more than N, for whatever that resource happens to be. If the villain doesn't have UU mana available in Magic: The Gathering, they can't cast Counterspell and if they have only one card in hand, they can't cast Force of Will. If they don't have 8 credits in Netrunner, they can't rez Heimdall 1.0; if they haven't scored any agendas, they can't rez Archer. Note that these rules are often not ironclad. Often skirting them involves either a combination of cards designed specifically to permit it, or a "broken" card that leverages resources too efficiently. The villain may only have one card in hand, but it could be Ancestral Recall to draw Force of Will and a blue card. They may only have 1 credit, but that's enough to rez Howler to put in a rezzed Heimdall. But these are plays that require a series of cards and outcomes that represent a very small possibility space; they also (usually) cost the villain additional resources (you'd rather use your Ancestral proactively, not in a desperate bid for countermagic; you'd rather install & rez Heimdall naturally instead of trashing it at the end of the turn to Howler) and so lower the relative penalty. Getting your Tinker countered by Force is a blowout. Making them blow Ancestral and 2 of the 3 cards they draw off of it to Force your Tinker is much more favorable. Meanwhile, one of the flaws of many games is the lack of a resource cost. Consider playing into a trap card in YuGiOh (I know, imagining playing YGO can be very painful; if you experience any headaches, lie down and think about Richard Garfield until they go away). Many powerful reactive trap cards in YGO like Mirror Force and Bottomless Trap Hole have no resource requirement and therefore no "shields down" moment: either the villain has them or they don't, and there's not a lot of counterplay. The only thing you can do is play to minimize the penalty they inflict on you. That's not the only reason resource costs are a good design element (or that YGO is a terrible game) but it's a compelling factor. A halfway implementation I'm not a big fan of is Hearthstone's "secrets" mechanic, where you pay the resource to create the secret and it fires automatically in response to a specific trigger (depending on the card). It often barely counts as hidden information, since each class only has so many secrets at a given mana cost, so it's often the same as playing any other card except it does something later instead of now (there are a few cards that put secrets into play on their own that can weird this up and expand the possibilities). The trigger conditions really only come in two forms: you can easily play around them, or you can't and have to walk into it eventually. Either way, while it may affect my decision making, it doesn't really change my attention curve; it's just an on-board trick like any other. More and more, I'm convinced that this property, or something like it, contributes to the success of the most engaging and successful asymmetric games.